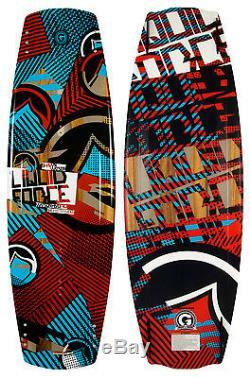 Liquid Force Watson Hybrid Wakeboard 143 Mens. The Watson name has become synonymous with class, style, perfection. Anything with the Watson name is guaranteed to be at the top of its class, and the Watson Hybrid does not disappoint. One of the most versatile boards in the world, Shawn rides this board equally well behind the boat as he does at the local cable park... The hybrid tech, LF exclusive Liquid Rail and GRIND base give it all the bells and whistles. Don't skip a beat with the Watson Hybrid! Key Features of the Liquid Force Watson Hybrid Wakeboard. Hybrid Technology: Combining the best of both riding worlds. New Watson performance hull shape and unique flex characteristics of our hybrid construction results in the board that boosts wake-to-wake, and has smooth, buttery flex for the ultimate in rail riding. LF Exclusive GRIND Base: Durable Sintered base material for long lasting rail park fun. Spiral "V" Triple Concave Mid-Section: Helps break the water for softer landings and initiates and rolls into turns quicker and easier. LF Exclusive Liquid Rail: Elastomeric sidewall created as the ultimate rail bond with unsurpassed durability. Give your board the ultimate beat down and our Liquid Rail will keep your inVest: Combination hybrid core provides the springiest, lightest flex in a core. Wood gives superior strength and flex. PVC keeps it as light as possible. Special Triax Glass: Glass weave provides torsional rigidity with increased longitudinal flex. The item "Liquid Force Watson Hybrid Wakeboard 143 Mens" is in sale since Thursday, May 18, 2017. This item is in the category "Sporting Goods\Water Sports\Wakeboarding & Waterskiing\Wakeboards".